Introduction: The laparoscopic Heller-Dor (LHD) surgery has become the procedure of choice for the treatment of achalasia. However, the incidence of achalasia is extremely low, and reports on the outcome of surgical treatment are limited. In this study, outcomes of LHD for achalasia in 200 patients at a single institution were evaluated. 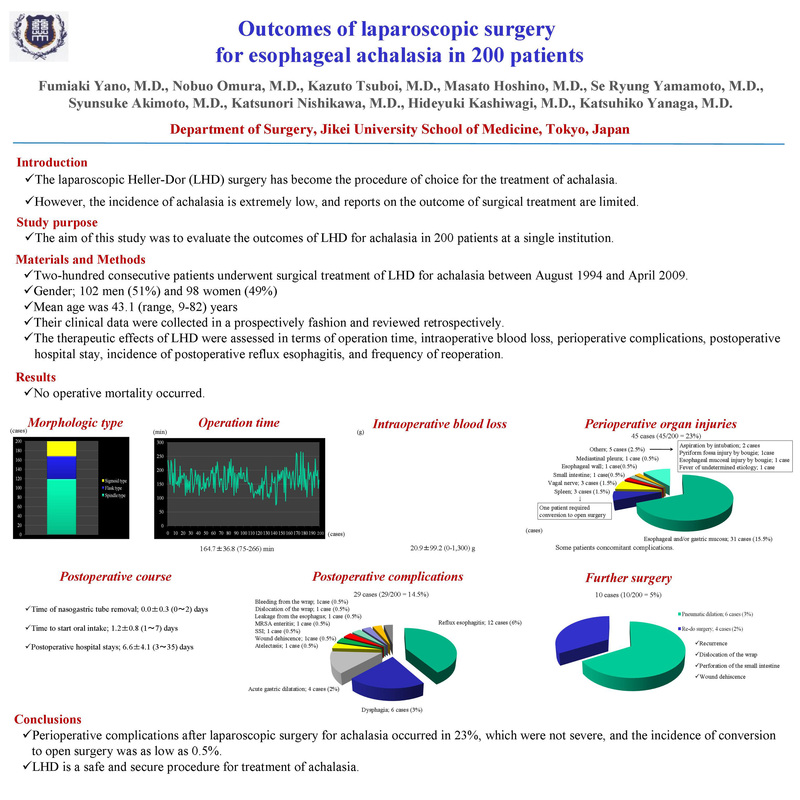 Methods: Two-hundred consecutive patients underwent surgical treatment of LHD for achalasia between August 1994 and April 2009. There were 102 men (51%) and 98 women (49%). Their mean age was 43.1 (range, 9-82) years. Their clinical data collected in a prospectively fashion was retrospectively reviewed. The therapeutic effects of LHD were assessed in terms of operation time, blood loss, perioperative complications, postoperative hospital stay, incidence of postoperative reflux esophagitis, and frequency of reoperation. Results: No operative mortality occurred. The mean operation time was 164.7±36.8 (range 75-266) minutes and the mean blood loss was 20.9 (range 0-1,300) ml. Perioperative complications occurred in 45 (23%) patients, consisting of injuries of the esophagus and/or gastric mucosa, vagal nerve, pyriform fossa, small intestine, and spleen. One patient (0.5%) who had splenic injury required conversion to open surgery. The mean postoperative hospital stay was 6.6±4.1 (range 3-35) days. Postoperative reflux esophagitis occurred in 12 (6%) patients and others 5 (2.5%) required the pneumatic dilation because of postoperative stenosis. Three (1.5%) patients required re-do surgery for dislocation of the wrap and perforation of the small intestine which was not identified intraoperatively. Postoperative questionnaire was available in 172 of 200 patients (86%). Most patients reported a high degree of satisfaction with surgery. The mean score (highest point was 5) was 4.6±0.7 (range 1-5). Conclusion: Perioperative complications occurred in 23% but these were not severe, and the incidence of convert to open surgery was as low as 0.5%. LHD is a safe and secure procedure for treatment of achalasia.